Personalised children’s books always make a fantastic gift. Perhaps you have seen them? Usually found advertised in weekly women’s magazines, you pay a predetermined price, and submit a particular name. A story book will then be sent out to you with that nominated name as the main character, having adventures with the rest of the characters in the book. While some may see it as a simple template-driven book idea, many people (especially those buying for people with unusual or unique names) find the personalised book quite clever. Items with people’s names on them are always popular, and it seems that when it comes to finding gifts for people, town names (where the person comes from) also apply. Steve Smallman, a British author and illustrator, has taken on the challenge of creating Christmas-themed books in this exact manner. 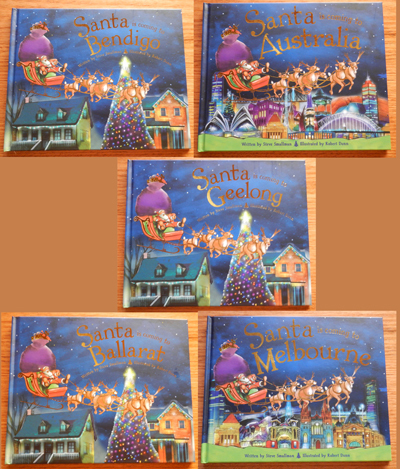 Having had success with a similar range of books in the USA and the UK over recent years, Smallman has turned his attention to creating a series of books in which Santa visits various Australian towns- both metropolitan and regional. Relying on his Santa-nav and the wonderful flying abilities of his reindeer (including a new young one, who saves them from getting hopelessly lost), Santa flies Down Under to deliver presents to the good children of Australia. Along the way, he sees various iconic landmarks in some of the biggest cities, and enjoys milk, cookies and carrots at each of the homes he stops at. While this is also a template-driven story (for the regional towns anyway), it can be quite exciting to see your hometown’s name mentioned as one of Santa’s stopping points- especially if it is not regularly seen in print outside of the region. With a decent storyline, pretty illustrations and a different type of ‘personalisation’, these picture story books will make a lovely addition to any Christmas present. Australia, Adelaide, Ballarat, Bendigo, Brisbane, Canberra, Geelong, Melbourne, My House, Newcastle, New South Wales, Perth, Queensland, South Australia, Sydney, Tasmania, The Outback, Western Australia, Wollongong.